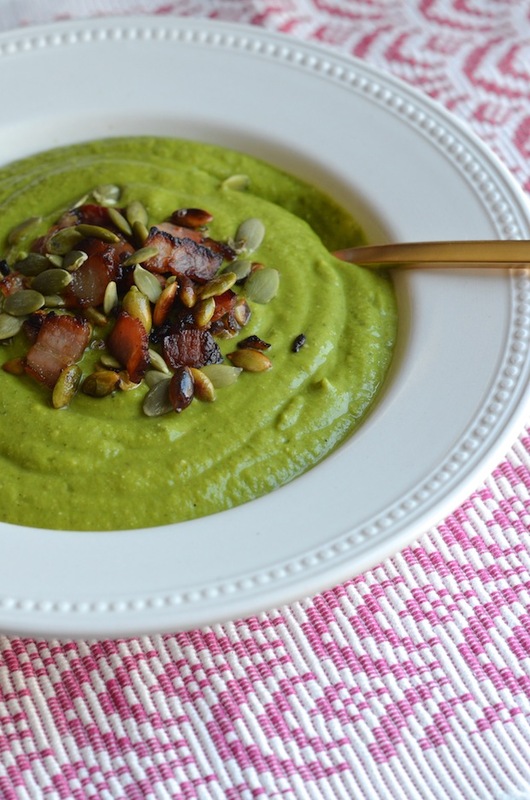 I believe the best quick soups start and end with bacon. You don't even need much, but it adds an unmistakable richness and level of background flavor that's otherwise tough to recreate unless you have hours. 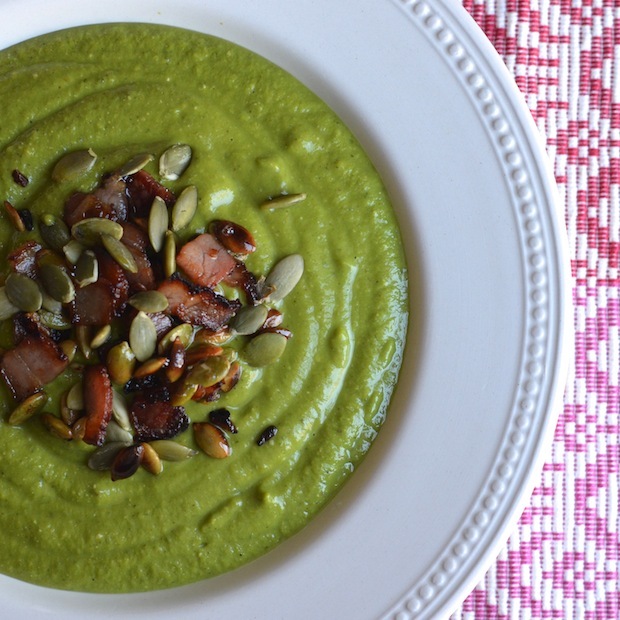 For this soup, I follow up the bacon with handfuls of green things--asparagus, zucchini, spinach--cooked just barely, then pureed until smooth and creamy. A bit of lemon for brightness. Garlic for spice. Toasted pumpkin seeds and the reserved bits of bacon, for crunch. I made this soup on one of those days when I needed a filling meal, but didn't want chicken or shrimp or pasta or any of the other things in my fridge. It was soothing and cozy and (so so) easy. I pureed this until velvety smooth in my blender--a super high powered Ninja that I love, but you can also use an immersion blender or a food processor. Whatever you have. Fry bacon in oil in a large pot over medium heat, until bacon is crisp and fat is rendered. Remove crispy bacon and set aside (reserve bacon fat in pot). Add the pumpkin seeds, and saute 2 minutes, or until toasted. Remove and set aside alone with cooked bacon. Add the onions and garlic, and saute 2 minutes, just until fragrant. Add the asparagus, zucchini, water and salt, and let simmer 10 minutes or until vegetables are tender. Add the parsley, spinach, and lemon juice, and puree until smooth. Taste and adjust seasoning, then serve garnished with pumpkin seeds and bacon.